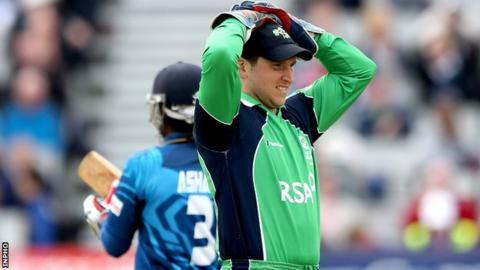 Gary Wilson insists Ireland can regroup from Tuesday's defeat by Sri Lanka to beat the tourists in Thursday's second one-day international at Clontarf. Sent into bat, the tourists were restricted to 219-8 in the chilly Clontarf conditions but the Irish were bowled out for 140 in under 40 overs. "We're confident we have the skills to pull off a win," said Surrey wicketkeeper-batsman Wilson. "We'll be playing on a different wicket with a little more grass on it." World Twenty20 champions Sri Lanka have rested five senior players, including bowling star Lasith Malinga. Mahela Jayawardene, Kumar Sangakkara, Rangana Herath and Tillakaratne Dilshan also sitting out the Dublin games. However, spinner Ajantha Mendis stepped up to star in Tuesday's clash as he produced figures of 3-27 which included the dismissals of Irish skipper William Porterfield and Niall O'Brien, who had looked the one home batsman capable to taking the fight to the visitors. Crucially, Ed Joyce, after his brilliant start to the English county campaign with Sussex, was dismissed for a duck off Suranga Lakmal, who also sent the hard-hitting Kevin O'Brien to the pavilion for nought. Prior to Tuesday's game, Ireland coach Phil Simmons had spoken of his belief that the cold Dublin conditions could unhinge the visitors and despite the comprehensive opening Sri Lankan victory, Wilson is continuing to hold out hope that the weather could help home prospects. "What we're after is as cold a day as possible," added Wilson. "It's not exactly the most pleasant for us either but it's a far cry from what the Sri Lankans are used to. "We will expect the ball to hip around in our kind of conditions." Tuesday's defeat follows Ireland's surprise early exit at the World Twenty20 in Bangladesh, when they were on the receiving end of an astonishing batting onslaught by the Netherlands. "It's only six or seven months ago that we did the treble of the Associate trophies," he said. "We had Trent there then but it wasn't just him who was performing well during that three-month period. "While Trent is a big loss, things move on and we've other guys well capable of putting in those kind of performances." Ireland (from): William Porterfield (capt), Alex Cusack, George Dockrell, Ed Joyce, Tim Murtagh, Andrew McBrine, Kevin O'Brien, Niall O'Brien, Andrew Poynter, Max Sorensen, Paul Stirling, Stuart Thompson, Gary Wilson.